On December 17, 1969, the United States Air Force closed Project Blue Book, its last program to investigate reports of unidentified flying objects (UFOs). Project Blue Book investigated unidentified flying objects (UFOs). 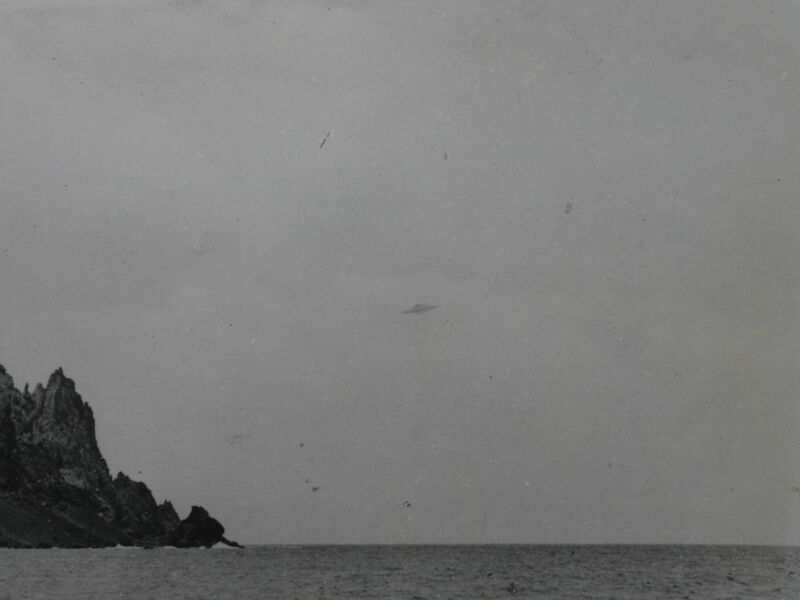 This UFO was photographed over Trindade Island, Brazil. Although never proven to be a hoax, the photographer was famous for publishing an article entitled "A Flying Saucer Hunted Me at Home," that used trick photography. Since its founding in 1947, Project Blue Book recorded more than 12,000 UFO sightings. Military leaders were concerned that some UFO sightings may have been experimental technology developed by the Soviet Union, the U.S.’s rival in the Cold War. Many civilians, on the other hand, associated UFOs with outer space and extraterrestrial intelligence. In the end, Project Blue Book found no evidence of technology “beyond the range of modern scientific knowledge” or threats to national security. Almost all UFO sightings investigated by the program were explained by weather phenomena, existing technology, or experimental technology developed by the U.S. itself. In fact, some of the unusually shaped UFOs spotted over Air Force bases were top-secret prototypes of U.S. aircraft such as the U-2 and A-12 spy planes. vehicle able to travel and operate above the ground. person who is not in the military. visible mass of tiny water droplets or ice crystals in Earth's atmosphere. (1947-1991) conflict between the Soviet Union (and its allies) and the United States (and its allies). The two sides never confronted each other directly. to worry or take an interest in. to learn or understand something for the first time. planet seen in the western sky soon after sunset, usually Venus. data that can be measured, observed, examined, and analyzed to support a conclusion. having to do with a test or trial version. located or formed outside Earth's atmosphere. ability to learn and understand. to study or examine in order to learn a series of facts. programs to protect a nation through economic, social, and political policy. to preserve observations with notes, drawings, photographs, audio or video recordings. (1922-1991) large northern Eurasian nation that had a communist government. Also called the Union of Soviet Socialist Republics, or the USSR. vehicle designed for travel outside Earth's atmosphere. (unidentified flying object) any unexplained moving object observed in the sky. state of the atmosphere, including temperature, atmospheric pressure, wind, humidity, precipitation, and cloudiness. hydrogen-filled balloon equipped with tools to measure temperature, humidity, pressure, and other aspects of the atmosphere. repeating or predictable changes in the Earth's atmosphere, such as winds, precipitation, and temperatures.